TV is all about escape: Students from all over reported that they were pretty agnostic about what they watched on television. While a few spoke of favorite shows, almost none spoke about ‘destination TV’: TV shows that students made an effort to watch religiously. Students most commonly mentioned ‘finding something to watch’ – which could be sports, popular shows, or classic programs (e.g. ‘Friends‘) – when they wanted to relax. TV is a group sport: The fact that TV, especially via a television set, is a broadcast medium – the audio goes out to an entire room – meant that students most frequently mentioned watching it together with friends or family, often over dinner or with snacks. One person would flip on the TV and others would gather around. As a side note: Very few students mentioned TiVo or other ways to record programming – most students spoke about watching TV via a television set, although students did mention that to watch a specific program, they tuned into television via their computers. 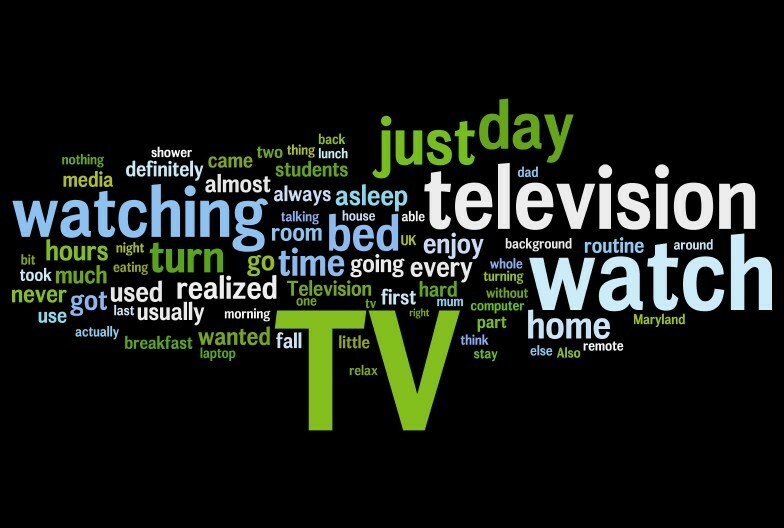 TV is background noise: Students frequently used the words ‘routine,’ ‘habit,’ and ‘instinctively,’ to characterize the way they typically engage with television. Many, from Chile to China, Lebanon to the UK, spoke about how it had become a reflex to turn on the TV when they walk into a room, to have it on as they eat their meals, and to have it on as ‘white noise’ as they go to sleep. TV ‘on’ for relaxation: Overwhelmingly, students reported that they watch TV to relax, especially toward the end of their day. Students around the world wrote that they rewarded themselves by watching a favorite TV program or sports game. If they had had a relatively productive day, they would watch TV before they went to bed. It was sitting there, right in front of me: Other students noted that TV was most often a group activity; they would only watch the TV when others were. Those students reported that for themselves they could take it or leave it, but if their friends or family were sitting down and watching, it was hard for them to avoid. Rarely mentioned, however, was intentionally turning to watch the news. Sport, weather and entertainment programs received much greater mention. Watching TV as a habit: Many students noted that they had become so habituated to having a TV on that they didn’t even realize that they had turned it on upon waking up or while eating. “I watch for hours every day and can watch almost anything from ‘Top Chef’ to ‘Desperate Housewives.’ Television actually amazes me more than it entertains me. Tuning in, Turning on: Students, no matter what country, rarely spoke about missing television news; what they missed was the soothing background that the TV provided. It was a way to relax without thinking too much, it provided familiar entertainment, and quite simply, it was another presence in the house. But what does it say that at least one student had to turn to prescription medicine to get to sleep without the background noise of television?